As I mentioned in my last food-related post, B and I haven’t had a ton of time to cook lately with the arrival of our son, so one-pot meals have been a regular occurrence around our house. 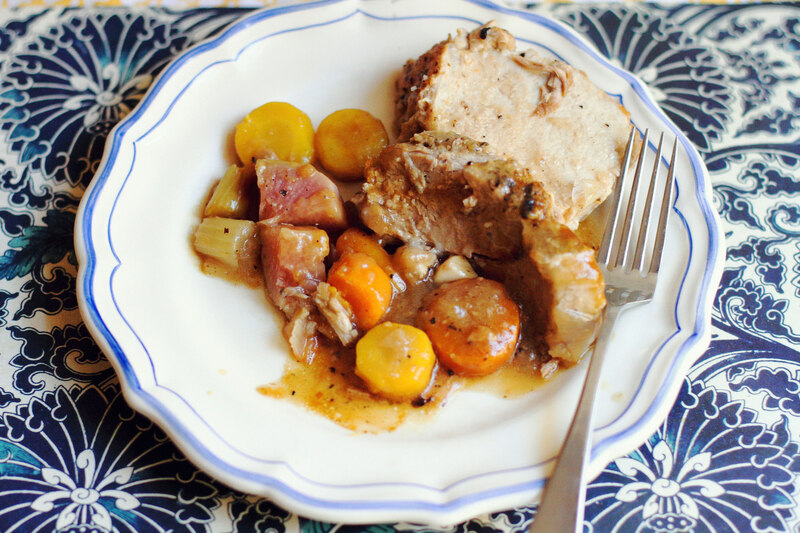 Both of us were in the mood for a good pot-roast with some fall root veggies the other day and when I came across this recipe that used pork shoulder instead of the usual beef, I thought this might be just what the doctor ordered. We tweaked the recipe slightly by adding some dried herbs and reducing the sauce to amp up the flavor and the end result was delicious! Preheat the oven to 300 degrees F. Season the roast very generously with salt and pepper, and then dust lightly with the flour. Put a Dutch oven over medium-high heat, and then add the olive oil. When the oil is hot, add the roast, and brown deeply on all sides, about 4 minutes per side. Remove the roast to a platter. Stir in the vinegar, shallots, celery, carrots, turnips, potatoes, and garlic, and then set the roast on top of the vegetables. 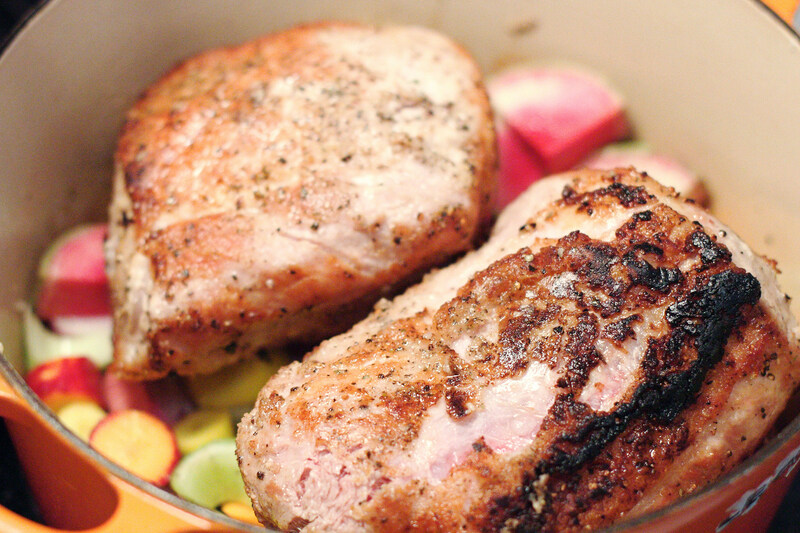 Sprinkle the herbs and pour the chicken stock and bourbon around the meat, cover, and roast in the oven for 2 hours. Transfer the roast to a cutting board. Remove the vegetables with a slotted spoon and place on a plate. Place the Dutch oven back on the burner and turn heat to medium. Mix the corn starch with a couple extra ounces of chicken stock or water and add to the remaining liquid in the Dutch oven. 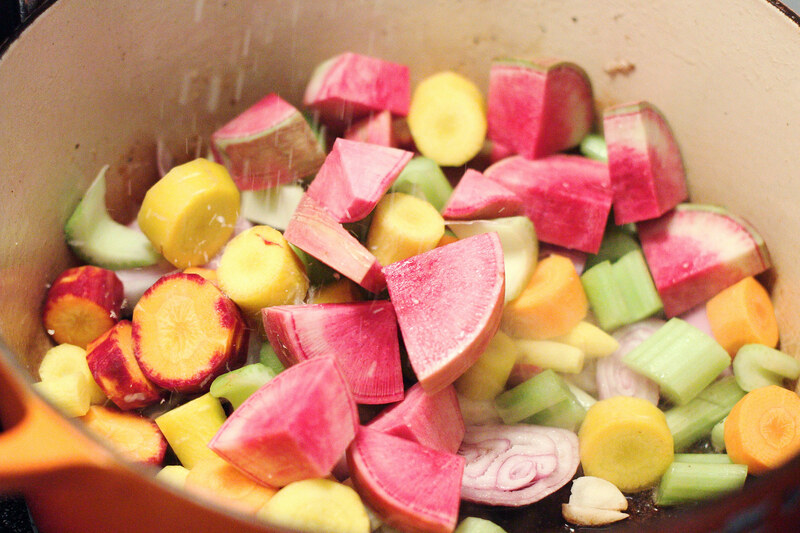 Continue cooking, stirring regularly, until thickened (about 10-15 minutes). Slice the roast, arrange the meat on top of the vegetables, drizzle with the thickened sauce, and serve family style. Great recipe! And the pics make me want to eat this right now! Yum!!! All of this food looks amazing!!!! I love a good crock pot meal! This pot roast looks so tasty! I am definitely going to try this recipe! holy canoli this looks damn good!